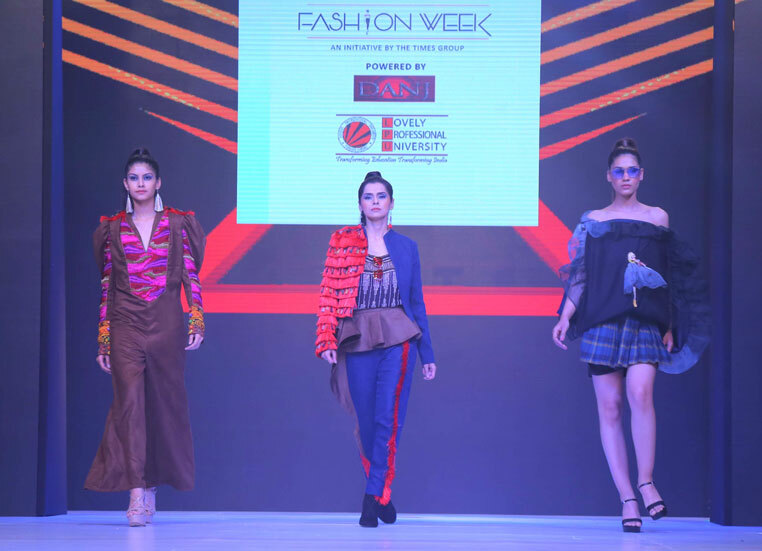 Providing with national level exposure to its fashion students, School of Fashion Design at Lovely Professional University inspired students to showcase their designer-clothes’ collection at Fashion Week-2019 organized in New Delhi. Making this massive participation as students’ annual graduating show, this year, in the capital city of the country; LPU elevated the students’ creations to next level, amid top designers and show-stoppers to learn a lot for their career ahead. Prior to this, annual graduating shows of LPU’s fashion school were organized at the campus only, where top models and beauty queens from across the country and globe ramp-walked wearing LPU students’ ensembles. In this event, over 40 LPU students presented their collection ranging from bustier tops paired with pants, jumpsuits, long maxi and tunic dresses. This participation provided unlimited impetus to both professional and creative sense of LPU students. This year, much-awaited ‘Fashion Week-2019’ was organized at Roseate Hotel in New Delhi, where elite fashion event showcased LPU students’ stylish, comfort focussed and youth needed ‘Designer-Clothes’. Students’ unique showcasing amazed all high profile celebrities and a large audience from the fashion industry, which was exclusively present during the show and at expo-stalls. Being among and in parallel with national & international designers Ritu Beri, Mandira Wirk, Charu Prashar, Ashfaque Ahmed, Subarna Ray, Narendra Kumar, Neetu Singh, Ashima Leena, Neeki Mahajan and more, LPU students experimented with maximum of creative designs, patterns, fabrics and colours as their enthralling presentations. Budding fashion designers at LPU presented their ensembles inspired through themes like “The Reflection of Divinity”, “G Aya Nu”, “Mistaken Identity”, ‘’Best Out of Waste’’, “Na Sarang”, “Reframing Thoughts”, “I Am Not What Happens To Me, I Am What I Choose To Become.” “Yugen”, “Positive Negative”, “Reframing Thoughts”, “Balance In Imbalance”, “Childhood Memories”, “La Boussolu” and “Scarlet Temptations”. Each theme was a true representation of the personality and thought process of the designer concerned. Mrs Universe Euro-Asia Rashmi Sachdeva, Leading fashion stylist Harsh Khullar, and many other national and international designers reached students’ stall also and appreciated their creativity. Feeling amazingly happy on seeing the enthralling creations of LPU students, and the world class exposure meted out to them, LPU Chancellor Mr Ashok Mittal shares: “We wanted to provide next level exposure and experience to our fashion students, so we chose the elite Delhi Fashion Week as the platform. Our students have done amazing work and I am proud of all of them. This is the first time that our students have stepped out in the national market, and it really proved a wonderful opportunity for all of them. I also congratulate all their teachers and instructors those led students to an elevated platform”.